Simulation Team develops many different kind of training simulation from Ship Bridge for Defense & Commercial Applications to Port Cranes, Drones and Vehicles. 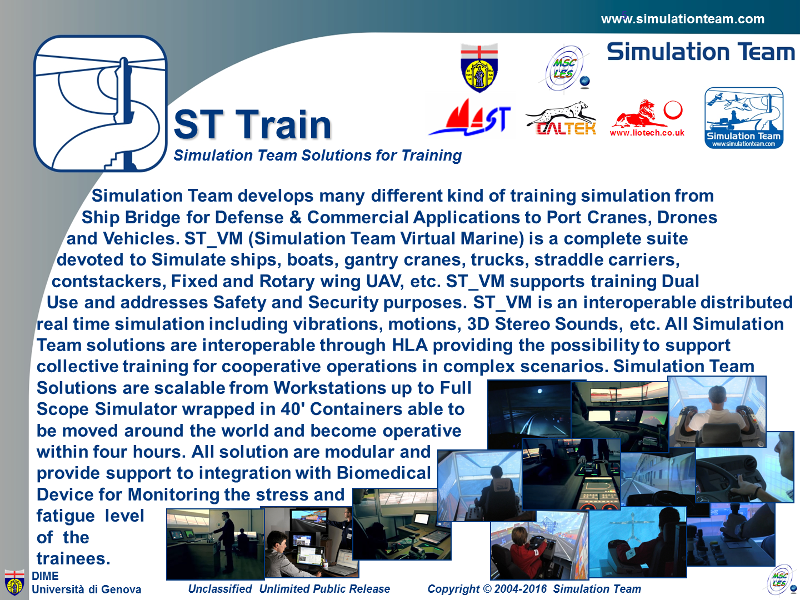 ST_VM (Simulation Team Virtual Marine) is a complete suite devoted to Simulate ships, boats, gantry cranes, trucks, straddle carriers, contstackers, Fixed and Rotary wing UAV, etc. ST_VM supports training Dual Use and addresses Safety and Security purposes. ST_VM is an interoperable distributed real time simulation including vibrations, motions, 3D Stereo Sounds, etc. All Simulation Team solutions are interoperable through HLA providing the possibility to support collective training for cooperative operations in complex scenarios. Simulation Team Solutions are scalable from Workstations up to Full Scope Simulator wrapped in 40' Containers able to be moved around the world and become operative within four hours. All solution are modular and provide support to integration with Biomedical Device for Monitoring the stress and fatigue level of the trainees.